Abdominal trauma involves injury to the belly between the chest and the hips and the internal organs there – the most common injuries to organs in the belly include the small intestine, liver, spleen, pancreas, kidneys, and bladder. Click here for a glossary with information on anatomy and types of injury. Follow instructions provided by your healthcare provider (doctor or nurse practitioner). It is important that your child follow all of the special instructions given by your healthcare provider to decrease any risk of bleeding inside. How long should my child only have minimal activity or "house arrest"? 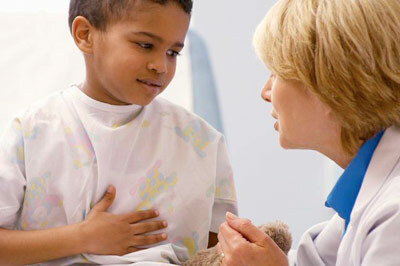 This will generally depend on the grade of injury to your child's organ or how severe it was. Your doctor will tell you what minimal activity means. It could include activities such as quiet play, reading, coloring, and watching TV. It probably means that your child will have to avoid sports for a period of time. When can my child start gym? contact sports? biking? or rough play? This will also depend on the grade of injury to your child's organ or how severe it was. What is the best number to call for emergencies during the week? On weekends? Any other concerns that you may have.